Orchids are amazing plants with beautiful flowers that are also tough as nails. It is a little unnerving when the air roots start coming out of the pot on a person's first orchid. However, overall orchids delight. This little orchid lived on my Mother-in-laws patio for 5 years after it was given to her before it bloomed. She was both surprised and delighted. This entry was posted on Friday, May 11th, 2012 at 9:35 am. 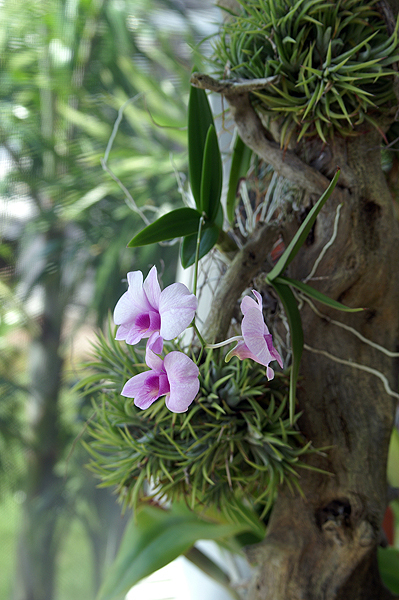 It is filed under Nature, New Images and tagged with blooming, dendrobium, flower, lavender, orchid, plant. You can follow any responses to this entry through the RSS 2.0 feed.